Coconut or coconut milk is not something that I use very often in my cooking and thus I stock coconut with me very rare and same goes with coconut milk too. 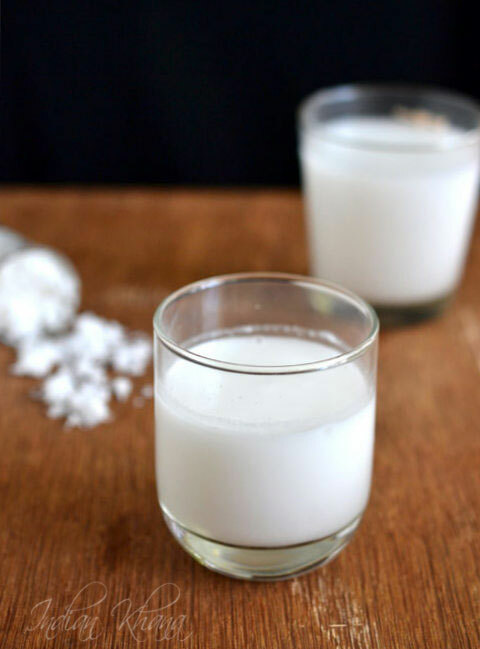 As coconut milk is more included in South Indian food like payasam, stews, and most of the Kerala cuisine calls for Coconut milk than in North India, we hardly use coconut milk in any of the North Indian Cuisine. For me buying fresh grated coconut is easy and I freeze it use later and if any recipe required coconut milk then I try to make my own exactly the amount I require not extra so I don't have to store and worry about what to do with remaining coconut milk, nothing can beat home made fresh coconut milk I am sure we all agree on this. 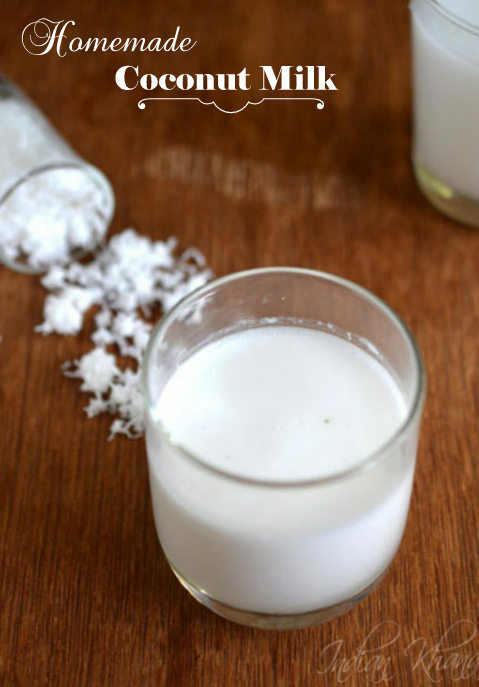 Homemade coconut milk hardly takes any time it's super easy and quick. 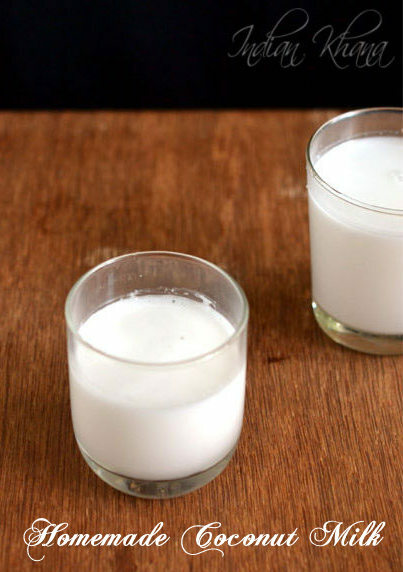 Coconut milk is normally categorize into first milk (thick), second milk (thin) and third milk (thinner). Mostly people only exact first and second milk but if you wish you can extra one more time to get very thin coconut milk and use it for any dish replacing it with plain water too. Easy process of extracting coconut milk from fresh shredded coconut (grated coconut). Heat 4 cups of water and once it's starts to bubble off flame. In a mixer or blender add grated coconut, 1.5 cups water and allow water to cool down, keep aside for around 5 minutes. Once it's cooled down blend well for around 1-2 minutes . Place a sieve over a bowl and pour prepared milk, press coconut coconut shreds with hand or a spoon to extract milk from shreds too. We got out first thick coconut milk. You can do this in batches too. Add coconut shreds back to mixer and add another 1 to 1.5 cups of water and allow to cool again. Blend for a minute and sieve it in another bowl and press coconut shreds again, second or thin milk we have now. You can use all remaining water to extra milk in 2nd batch too to have thick and thin coconut milk. Again add the coconut shreds to mixer add water, blend and sieve in another bowl to get thin milk or use hand to mix coconut shred with water and extra it or you can discard coconut shred after 2nd extraction. Or you can use 2 cups of water in first batch and another 2 cups in send batch to get thick and thinner coconut milk. Use as required for biryani, curry, sweets, milkshakes or anything that required coconut milk. Thick milk add always in the end of recipe like payasam or gravy, thick coconut milk should never boil. To flavor coconut milk add 1/2 tsp of vanilla extract. Normally used in the same way extracted coconut milk but if you keep for 2-3 days in fridge, just shake or mix it well before using. 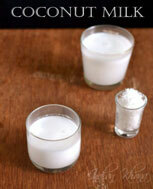 Easy homemade coconut milk is ready to use, you can check other homemade (DIY) recipes here.